Welcome to the Team 75 FRC Java Tutorial! 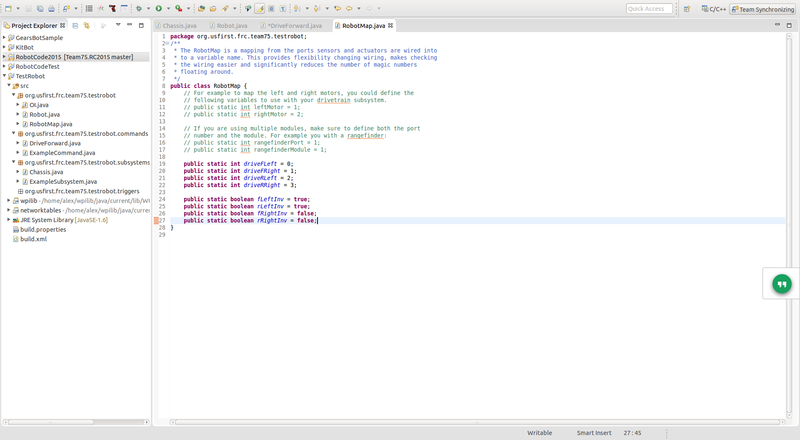 The programming language we will be using to program the robot starting in the 2015 season will be Java. Java is a powerful, robust, and generally fast language used by much of the industry. For instance, Google uses Java as the backend for most of its most important services, as does Verizon, AT&T, and many other large companies. It is clearly a great language. 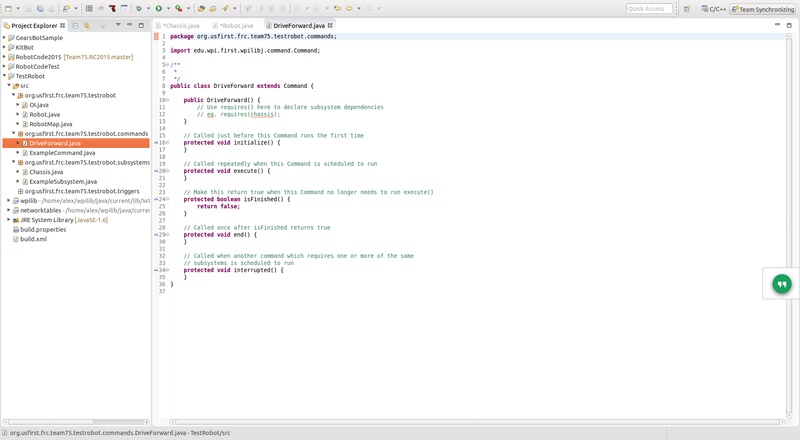 However, to use it to its full ability, you must understand how Java works. Let's start with the basics. 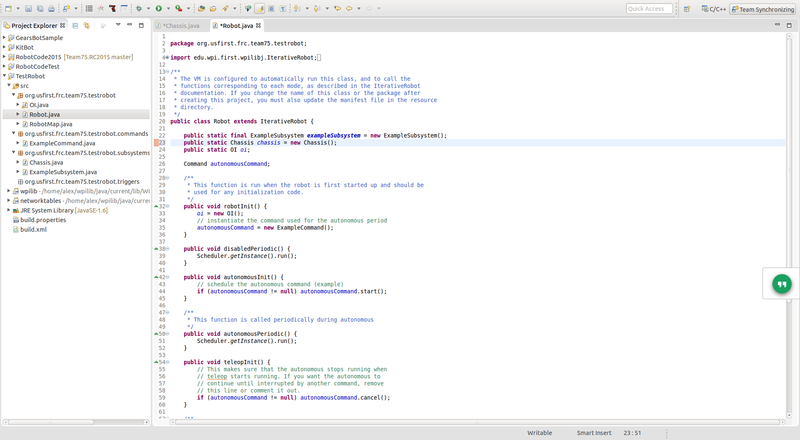 To code in Java, you will need a program called an Integrated Development Environment, or IDE for short. Warning: We will not be using NetBeans for the 2015 season. We will use Eclipse. However, we will keep this here in case it is needed for older robots. 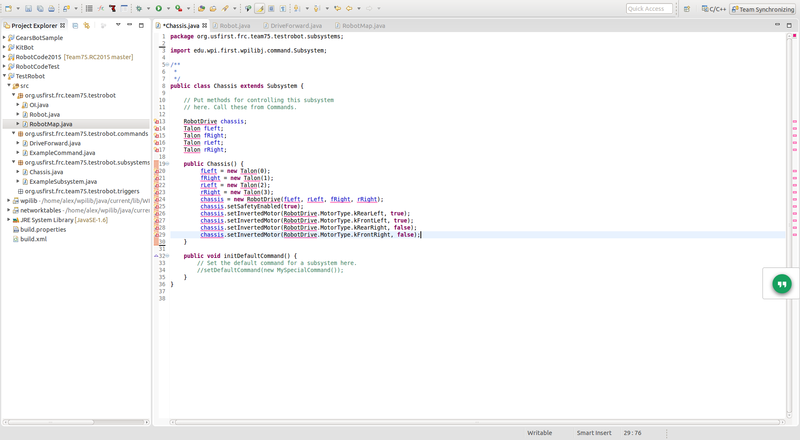 For years prior to 2015, the IDE used was Netbeans, which can be downloaded from NetBeans's Site. 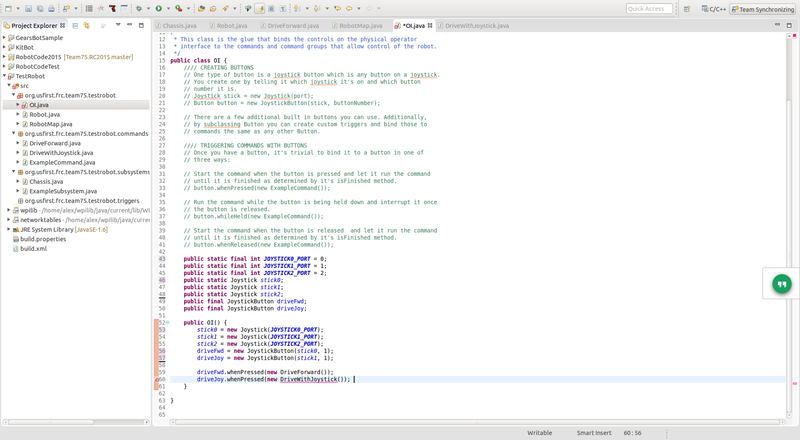 Here's the link for my instructions on setting up NetBeans: NetBeans Setup. For the old 2013/2014 API, use this link: 2014 FRC API. 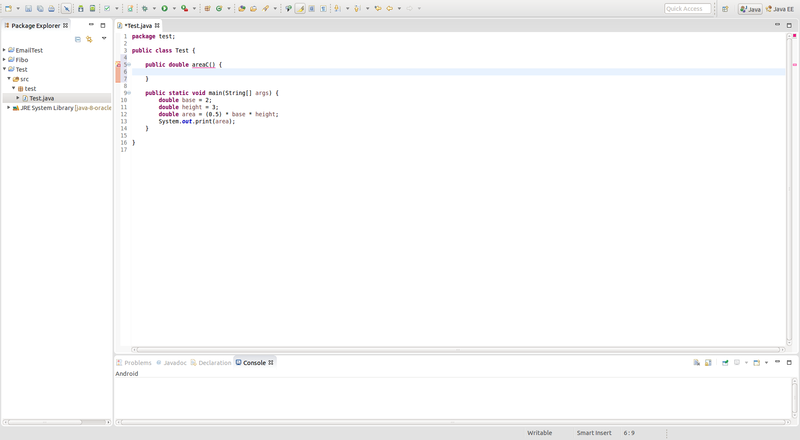 Starting with the 2015 season, we will be using Eclipse. 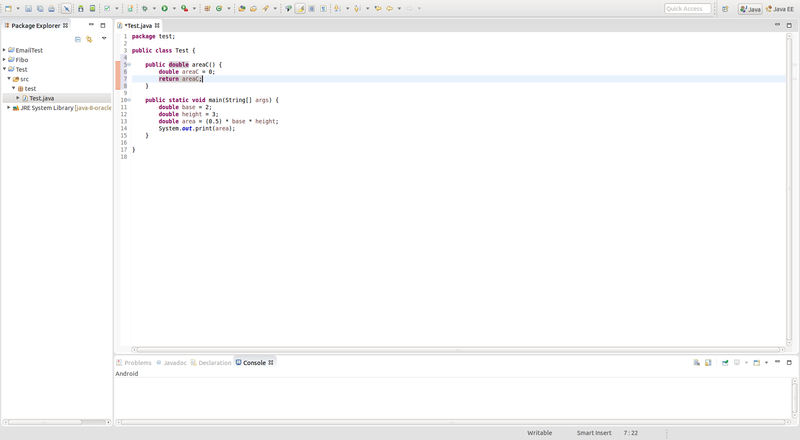 To set up Eclipse to work with our robot code, just follow these instructions: Installing Eclipse with FRC Plugins. For Ubuntu, you can install it alongside FRCSim by using the command found on the same site here: Installing FRCSim with a terminal. 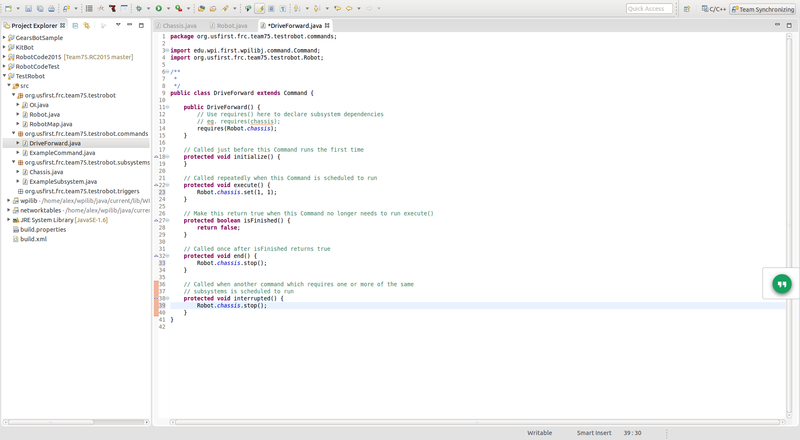 When coding for the robot, you will need documentation for the hundreds of classes contained in the FRC Java API. Here is a link to the javadoc with all the information that you will need once you are ready to code the robot: 2015 FRC API. 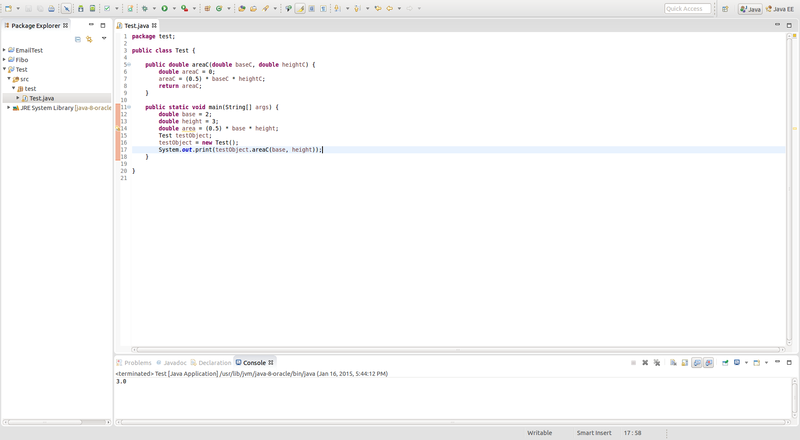 Once you have your IDE installed, you can start coding. 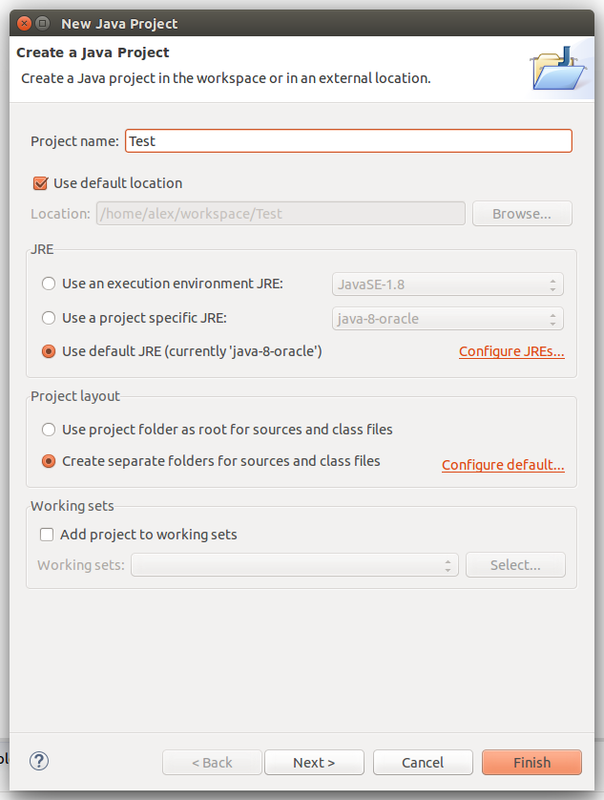 To do this, go to File → New → Java Project , and give your project a name. We will be using "Test" for this part of the tutorial. This is a more complicated topic of Java that only really starts to get explained in college level courses and isn't important to understand perfectly for our purposes. It basically helps organize different classes and for more complex projects can be used to manage program security. 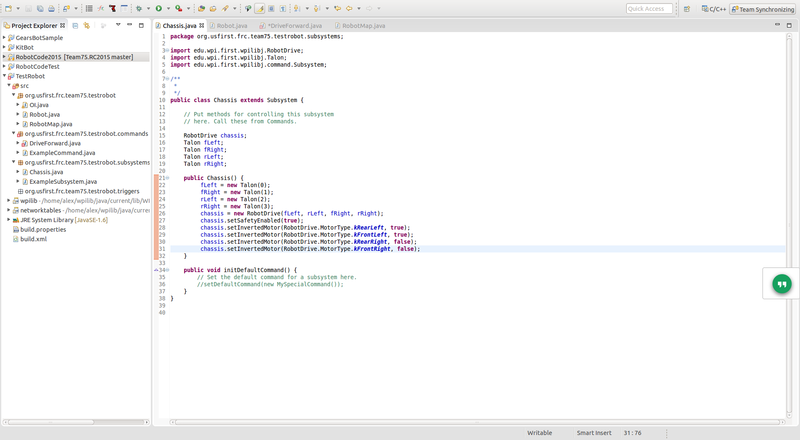 This is where all the code (except for the "package" declaration and something else called imports) is put. We will talk more about what exactly a class is when we talk about object orientation later on in this tutorial. 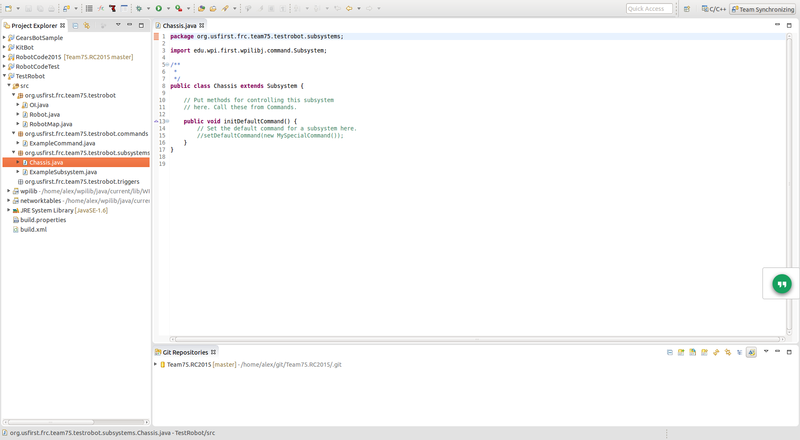 The most important section of Java code is the "main method". This is the code that is run when a program is opened. 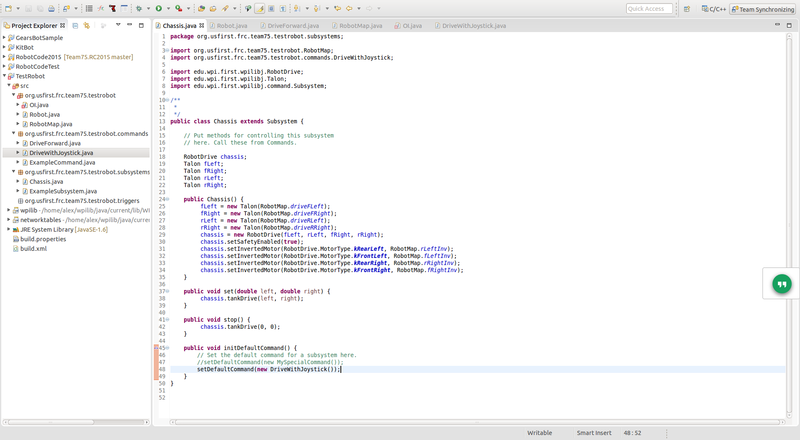 In the FRC Java API, we do not actually see the main method, but it is running in the background of the robot project. This brings up another topic. What is a method? A method is a chunk of code in a class. 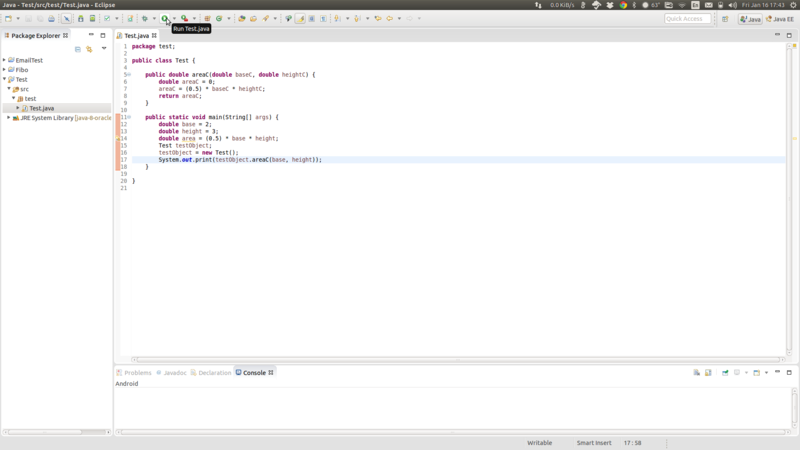 You can have methods to do basically anything such as output a line, calculate an area, or write data to a hard drive. The main method is just the first chunk that loads. Since they are already declared as doubles, you don't need to add a dot to the number. Now you have variable that you can use in your code! To use them, just replace the numbers from the code with the variable. Also, if you wish, you can divide by two instead of multiplying by (0.5). We don't have to put a period after the 2 now since we are doing the division on a double. If you want to run the code we've just created, first click on the "Run" icon. This will automatically clean, build, and run the project. Note that print simply outputs a String and that's it. For code where we may use multiple lines of output, you can use System.out.println, which adds a line after its text, instead of System.out.print, which just outputs what it is given without any spaces. Note: you can use as many "if else" statements as you wish. This is basically all you need to know about basic java before you can learn about the basic robot code. If anything else that we need comes up during the season, you will be taught then. If you are unsure of something, go back and read over this section again. If re-reading does not help, ask the manager or mentor through email or at the warehouse. Preface: To understand why the robot code is structured as it is, you need to understand real-time processing. The Operating System on the roboRIO and the API (specific libraries for use by us) that goes along with it are designed to be real time. If the real-time tasks (an example would be PID error correction) are not run on time, they would not run correctly. In other words, time critical tasks must not be interrupted and the code had been structured for this. 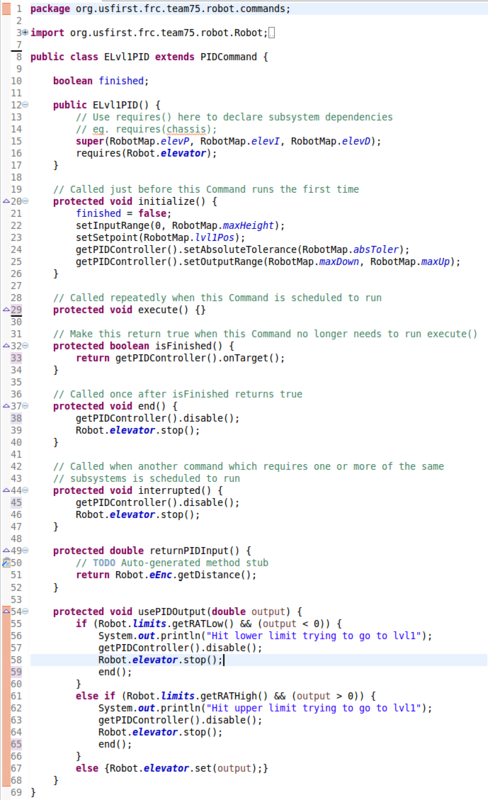 This should help you understand the way the code is designed for the robot. Now let's talk about the stucture of the code, starting with what happens when the code starts. 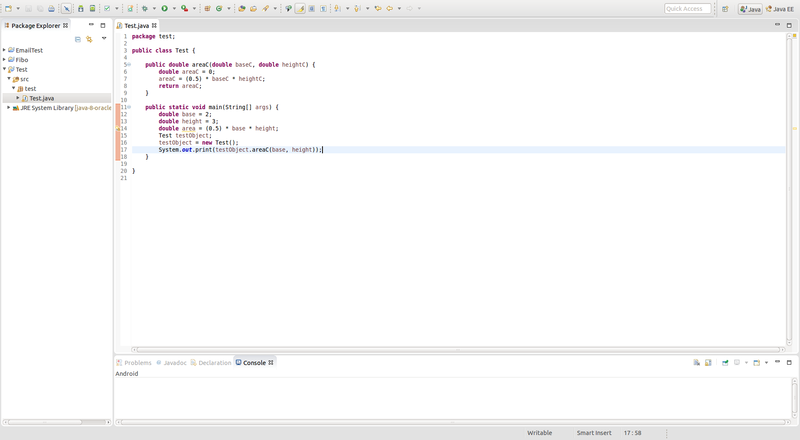 First, the robot runs a main class, similar to a normal java program. The very first method of the class that is run is called robotInit. This code basically sets up the entire robot and gets it ready to go. It sets the autonomous mode, or in our case gives our drivers a choice between multiple autonomous modes, it sets preferences, and it readies the subsystems and their default commands for use. The rest of the main class for the robot is managed by background tasks, so we don't have to worry about that. I mentioned earlier "subsystems and their default commands". You may be wondering what I mean by a command, and that leads us to the next section of this tutorial: commands and subsystems. Remember how I talked about real time processing in the preface to this section? Well, this is where it is used. As we will be doing calculations in our code, we need to make sure we don't make the code crash due to an infinite loop or something similar. If the robot was moving forward during that time, it would continue moving forward if the program crashes, which can be very dangerous. Thus, we have a specific type of class that does calculations and another that simply interacts with the hardware. Commands are the classes that do calculations, and subsystems are the classes that interact with the hardware. This way, if you have a calculation that's taking a long time and not responding, you still have your subsystem active to manage the robot's movements. This also ensures that real time tasks such as PID run correctly as they are independent of other parts of the program. There are 2 final classes you need to know about when you make your code: OI and RobotMap. OI, which is short for Operator Interface, is the class that manages input from joysticks and the buttons. It tells the robot what command to run when a button is pressed and allows the robot to use joystick values globally (any part of the program can use joystick values if it needs to). The RobotMap is simply a data store for wiring. When we are making our robot code initially, the robot will not be finished and thus will not be wired. Thus, we can just store values in RobotMap and when electrical is done we can just take all the values for motor ports and such and add them all in one central location intead of searching for them in different files of the project. It also allows us to set universal values for things like height limits for the elevator. Now let's recap the way the robot code works. Main Robot class runs and calls robotInit method, which sets up autonomous modes, preferences, and other important values. Also readies commands and subsystems. OI or Operator Interface instantiates joysticks and their buttons. In the OI, the buttons are attached to certain commands that will be executed when the button is pressed. 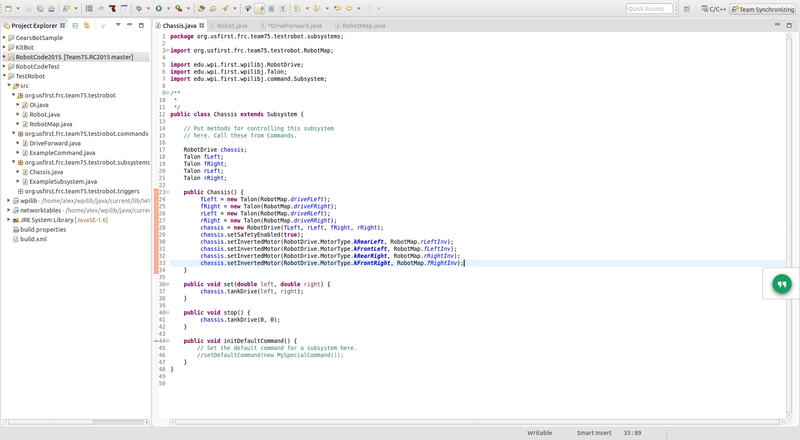 Other parts of the code can use the joystick values as well. RobotMap stores values used by subsystems mainly consisting of electrical ports that are not finalized until later on. Makes setting values easier as they are all stored in one file instead of scattered around the program. Commands do calculations and send calculated values for motors and such to subsystems, whose only purpose is to give these values to the hardware. This is done to separate time critical and hardware related tasks from calculations that may cause the program to crash. This separation allows time critical tasks run without running into issues with timing errors and it also gives a safety so that there is always a task interacting with the hardware so the robot doesn't randomly crash into things due a code glitch. Now, lets talk about the methods that are created by default in commands and subsystems. 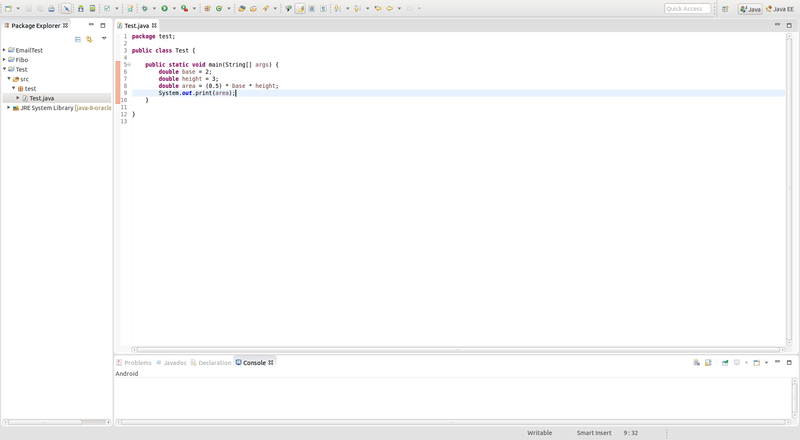 Constructor: While it's not really a method, it sets everything up. Its main use in commands is to tell the code what subsystems this command uses. If another command is running that requires the same subsystem as this and this is called, the other command is stopped by calling its interrupted method, which is explained lower in this list. To set a required subsystem, you simply type requires(Robot.subsystemInstantiatedInRobotClass); I will give an example in the next section of this tutorial, "How to use the FRC API". initialize: Code that needs to be run only once when the command starts. 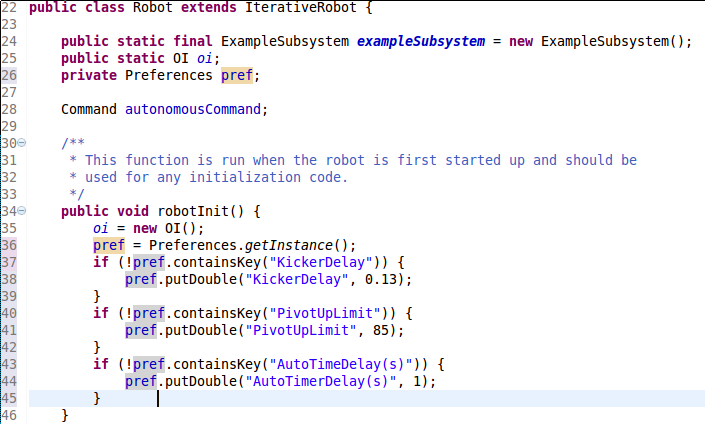 For instance, the 2014 robot's kick sequence was run in the initialize method. execute: Code that is run in a loop. The robot will loop over this code every 20ms (unless the code in here is still running, in which case it will let it finish first). In the 2014 robot's kick command, the execute method was used to run the kicker motor to pull back the kicker until it was back in the ready position. isFinished: This method is used after each run on the execute method to check if the method is ready to stop. By default, it returns false and thus the command runs indefinietely. To change this, create a new boolean (true of false variable) in the command that the execute method changes when the purpose of the command is achieved. Then, change the return value of this method from false to the boolean you created. An example in the 2014 robot was the kick command, in which the isFinished method would return true and end the command when the kicker was back in its loaded position. end: This method is run after isFinished returns true. Use this method to stop all motors when the command ends. interrupted: Similar to the end method, this method runs when the command is stopped due to another command requiring one of the subsystem this command requires. Use this method to stop all motors before switching to the new command. That's it for the command. We will talk more about how to use it in the next section. initDefaultCommand: Used to set a default command that runs when no other command requires this subsystem. An example of its use in the 2014 robot was the Rollers subsystem. It would automatically start the RAuto command, which would manage the rollers automatically based on values from the roller limits. As the FullKick command required the roller motors, RAuto would stop to let FullKick run its code. 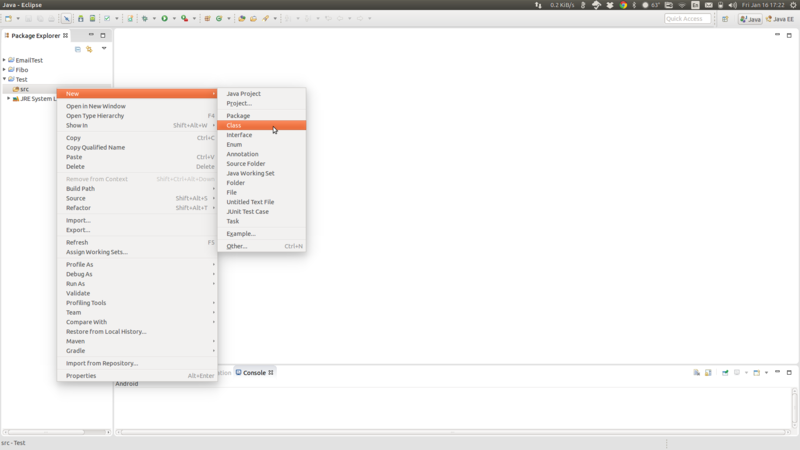 Then, when FullKick ended, RAuto would be started again as it is the roller subsystem's default command. Other than that, you create your own methods for the commands to set motor values and such to the hardware through the subsystem. We will go more in depth in the next section. This was a very difficult section, and it is suggested that you read over this a few times until you understand the basics on the set up of the code. The next section will show you how to actually use this information to make a basic robot code. And remember, you don't need to understand this section perfectly. If you understand just the general structure of the robot code and how commands and subsystems work, you should be ready to move on. Git: When the season starts, the programming manager will create a project based on the robot template that was designed to be used in the way described in the previous section. He will then upload it to something called git. Git is a Version Control System, or VCS. It allows us to work on the same code more easily and also keep track of changes, so we can see where bugs were created. The main reason, however, is just that it makes it easier for all of us to be working at the same time. Once the server has been set up and the initial project is ready to be working on, make sure that when you commit (upload your modified code), ALWAYS PUT A MESSAGE INDICATING WHAT YOU CHANGED. It makes it easier to track. If you added a new file, you can state that this is the initial commit for said file. If you modified a file, say what exactly you changed. The programming manager will give you a part of the robot you will be working on, such as kicker, chassis, etc. You will likely be working with one more person on the same project. First, make the subsystem. You will need to know what hardware you will be instantiating for your subsystem. You should ask the programming manager what parts these are (mainly for the speed controllers for the motors). Once you finish the subsystem. It needs to be put in the Robot. DO NOT EDIT THE ROBOT CLASS YOURSELF. First, commit your subsystem, then go to the programming manager and tell him/her that you need to add a subsystem to the robot class and do it on that computer. If we have everybody editing on their own computers, it may get messy with people's codes conflicting. By doing it only on one computer, we can avoid these conflicts. Now that the Robot class has the subsystem declared, update the git repository on your computer to get the updated Robot class and the work on your command. Once your command is finished, ask the programming manager what to do. He/She will give you another task to work on or let you relax until he/she finds something for you to do. We will probably have side projects to help you learn more java, as the robot code doesn't usually take too long and we don't get to test the code until later in the season. Edit Robot class on manager's laptop and then update your git repository. Remember, if you have any questions, ask the programming manager for help. Also, you may have to declare multiple subsystems to do certain tasks. Now, let's make some code. Starting with the first task, lets say our job is to add a drivetrain (a.k.a. chassis) that will simply drive forward. We will call the subsystem chassis. Obviously, the actual robot code will be more complicated, but that is why there is a "Complex" section in this tutorial! To make the subsystem, right click on the subsystems package on the projects pane on the left and create a new subsystem. By convention, names of classes are capitalized with every word in them capitalized (there can be no spaces in class names). For this class, we will call it "Chassis". Also, we might abbreviate certain names to make the code easier to read. If the manager tells you to abbreviate "Rollers" to "R", you would make a subsystem "RMotor" and the automatic roller command as "RAuto", for example. Now, you need to instantiate the hardware being used and create the methods of the subsystem to manage it. Here, you will need to use the FRC API to find out how to control the hardware. You can find one on this site here: FRC API Javadoc. You will notice that we have many errors. These are related to imports. Since the classes we are trying to access are not in the same package as the subsystem, the computer doesn't know where the class you are referring to is. To fix this, right click on a red underlined portion (or hit F2-Enter while the cursor is over it) and select "Add import ... " to add the import. This will fix the problem. Now the only thing we haven't finished is the initDefaultCommand, but we haven't named our command yet. So, we move onto the next step, which is instantiating the subsystem in the Robot class. Remember, this is to be done on the programming manager's computer to prevent conflicts with other people's commits. Now you have a basic robot code that drives forward. Now we will go on to the complex section, where we will talk about more advanced code and structure it more the way that we would for our final robot code. The command group will continue once the sequential command finishes without regard to when the parallel command finishes. The most common use for command groups for us is in autonomous. As our example project was extremely basic, I will not show you how to do this in the example project. For reference, look in the code used on our actual robots (links in the Example Project section below). 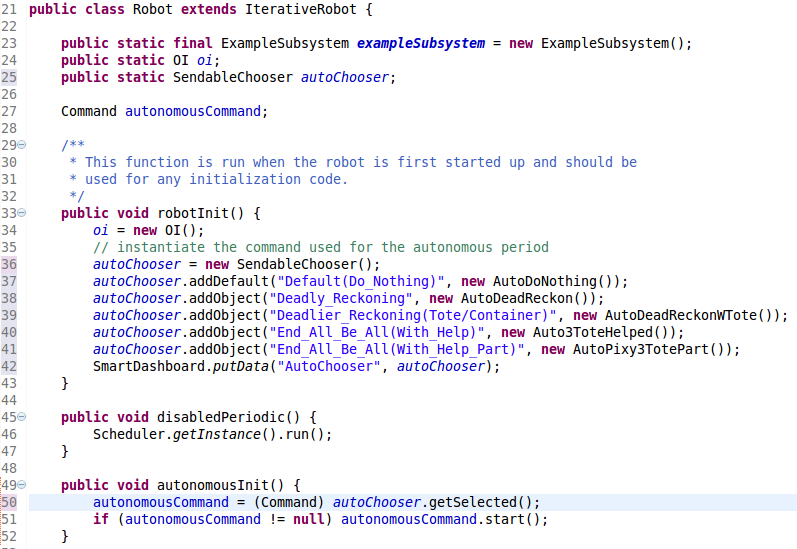 You will see the autonomous chooser that allows our drivers to choose which autonomous mode to use (as we have multiple) and how that is used in the RobotMain (specifically the robotInit and autonomousInit methods). The Autonomous Chooser is also explained in the "Super Complex" section of this tutorial. To add a zipped project to your Eclipse, use File → Import ... . Whe you get to the window, select "General" and then "Existing Projects into Workspace". When you hit next, you will be able to choose a folder or an archive file to import. If you want another tutorial, you can look at this tutorial, made by WPI, the university that helped create and maintains the FRC Java API: WPILib Robot Programming Cookbook. Do note that it is from 2012 so it has some outdated information and it is quite complicated. For receiving values from the robot and sending "Preferences" (explained lower) to the robot, we use what is called the SmartDashboard. In the robot code, we specify what data are read and sent to the SmartDashboard. The information is automatically read by the SmartDashboard so the drivers can see it. When the driver sends "Preferences", these are read and saved onto the internal memory of the robot. In this section, we will only talk about sending values to the dashboard. Preferences are described in detail in a lower section. There are many reasons why one may want to send values to the dashboard for the drivers. While it is mainly used by the programmers trying to debug code, it may be useful for the drivers to see various information such as alignment info from a camera, height or angle info for an arm, or distance/speed information. For basic installation and setup, refer to this website: Getting Started with the SmartDashboard. This code sends a the calculated distance of the elevator of the robot and sends it to the SmartDashboard with the label "Elevator Height". The SmartDashboard takes that information and automatically places that number in an empty space on the dashboard. 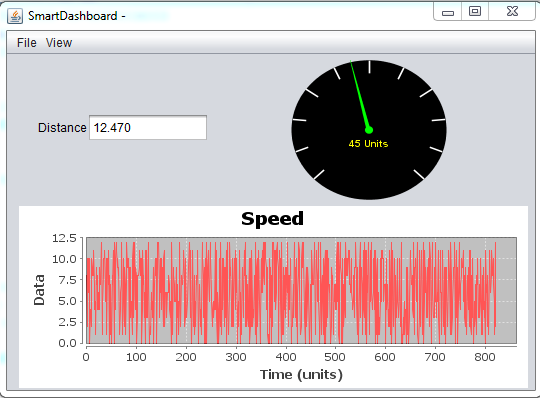 The drivers can then move that info box anywhere they want on the dashboard and also change it from a displayed number to a Compass, LinePlot, ProgressBar, SimpleDial, or FormattedField. These settings are stored in an xml file so they can be transferred between computers easily. The putData method may be a bit confusing as it isn't as specific as putNumber, putBoolean, and putString. 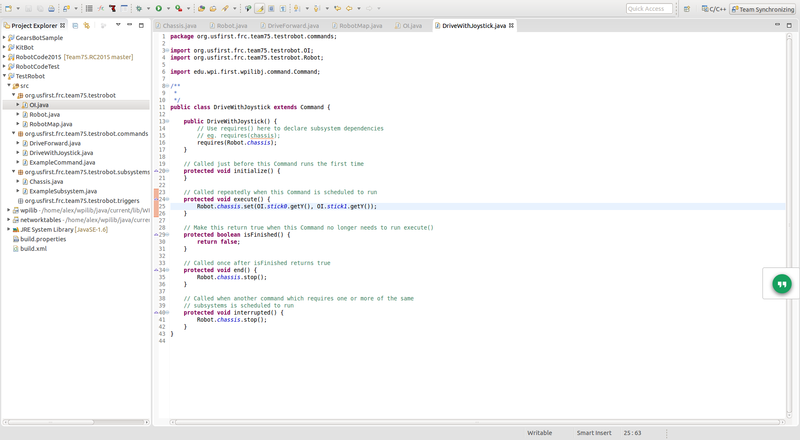 The putData method can send any object that implements the Sendable class. You can see what is able to be used in the "All Known Implementing Classes" section in the specification for the Sendable class in the javadoc. The one's explained on WPILib's site are: Command, Subsystem, Scheduler, and the Sendable Chooser (explained lower in the Auto Chooser section below). If you send a command, you will be able to start the command directly from the Dashboard. This can be useful when testing various commands to be used in Autonomous, Command Groups, and various commands that need to be tested. Sending a scheduler will show you every command running and will also allow you to cancel a command. If you send a subsystem, it will tell you what command is currently using that subsystem. The SendableChooser will send a list of options of anything to be chosen from by the drivers, such as autonomous options. This can allow very quick testing between multiple version of different commands that do similar things, different versions of a subsystem, and many more things. The most used and probably most useful option is sending commands or command groups to be used for autonomous. To learn about that, move to the the next section. If you want more in depth information about the SmartDashboard, use the Getting Started link: Getting Started with the SmartDashboard. Now the values are set up and ready to be used. To actually save the keys, you have to use pref.save() . Calling save() too often can damage the flash memory, so it should be set to save only about once a minute during teleop. You can also create a command that simply saves the preferences once teleop ends. To use these values in a Command, you need to declare it and instantiate it within that command. 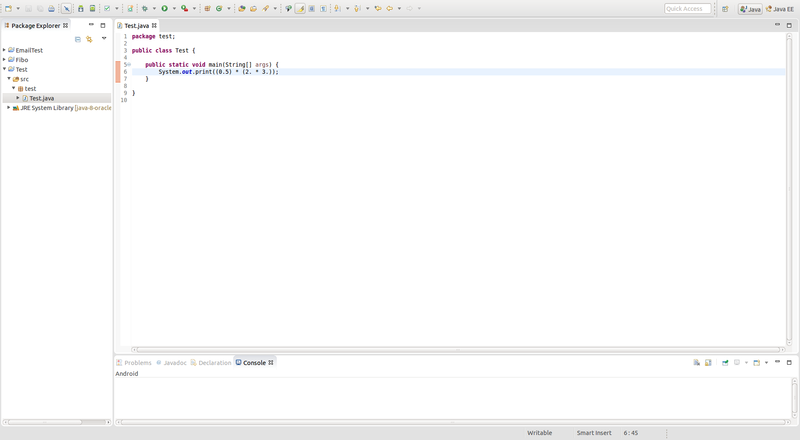 Then, you can use the get command that corresponds to the put command used in the main (just replace put with get). 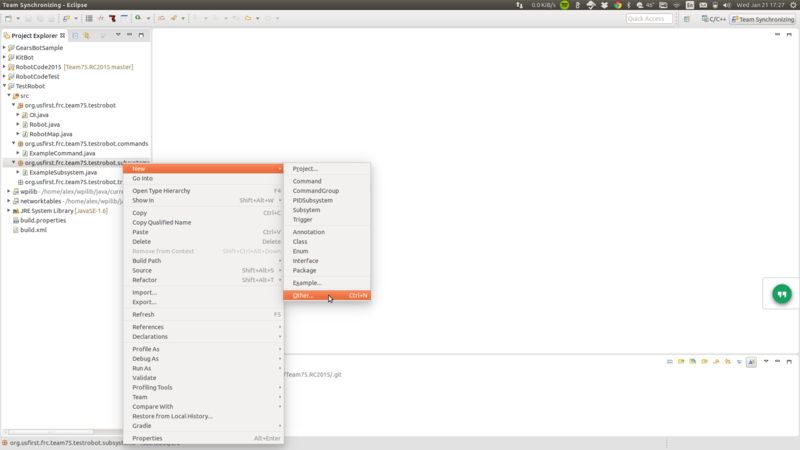 The get commands need the key declared in main and a fallback value in case it can't find that key in the preferences. 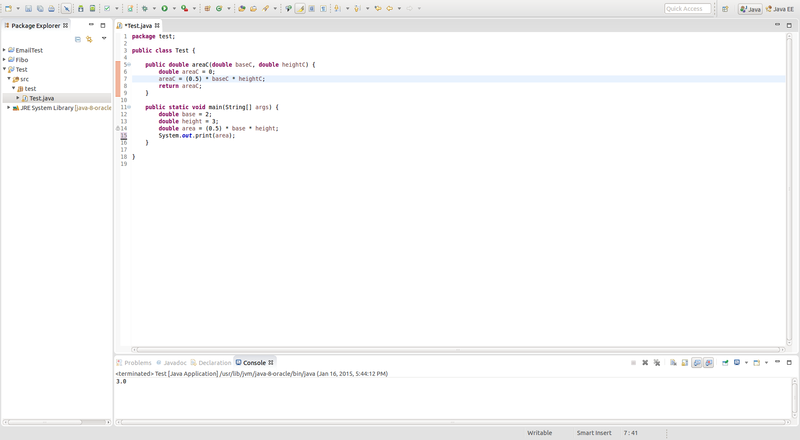 Here is an example getting the Kicker Delay created in the earlier example. Now you know how to set persistent values on the robot from the Dashboard. NOTE: The Preferences will not automatically be opened on the Dashboard. They can be added by going to View → Add → Robot Preferences. PID is used to allow a robot to reach a setpoint for something, whether it is the angle or height of the arm or a distance driven. PID is a complicated topic and knowledge of calculus is useful to understand it. However, the I and D values which use calculus aren't commonly used on our robots. Now, let's explain what PID stands for. P stands for proportional. It is the most simple part of PID and the most important. It simply tries to reach a setpoint. P is calculated by multiplying the a given "error" by the value of P. For instance, if you want your robot to drive 80 inches and start slowing down at 20 inches, you would give the error as (80 - inches driven) and you would use a P of 0.05 (anything higher than 20 multiplied by 0.05 would be greater than 1, so the robot would drive full speed. Anything under 20 would be below 1). You also need a tolerance, either absolute (such as inches) or percentage. This needs to be set to a value that makes sense in regards to motor response. Most motor controllers only respond to a signal with an absolute value grater than 0.04. If you try to give a value between -0.04 and 0.04, the motor will not do anything as that is likely in its "deadband". Also, the motor may simply not be powerful enough to move the robot, arm, or whatever the motor is controlling at low speed. This is part of the reason we have a tolerance (in our 2015 robot, the encoder reads to the 1/64th of an inch. The motor would not respond at lower speeds and thus the preset motor positions would not end their commands without some tolerance). The way to figure out the best values is just experimentation. The basic explanation above, however, is a good starting point. I stands for integral. The integral attempts to correct the output based on past error. An integral is the area under a curve, and if you place your goal and current state on a graph and find the area between these lines (under the goal is negative area), you have the integral. If done for an example like above where we're driving to a setpoint, you will overshoot the goal, then drive backwards, and forward agains, etc. What is a good use for it? A common example is the thermostat of a house. It will help adjust the temperature and keep it steady. For a robotics team, we could use it to keep an arm steady if that arm doesn't hold its position well (such as the 2011 robot Ellen, whose design could cause the arm to go up if no current was being applied to the motor). We haven't used it too much in past years. D is the final letter and stands for derivative. The derivative attempts to predict the future to further optimize performance. This is done by further smoothing out the line, allowing for higher P and I values while maintaining stability. There tends to be a lot of noise in the input and the derivative value can mess up a system quite badly if it isn't smoothened. We have used the derivative values in the past, but only with very, very low values that had minimal effect on the system. To go more in depth, go to this site, which was used to help make the quick guide above: PID for Dummies. Now, let's get into the programming side of this. 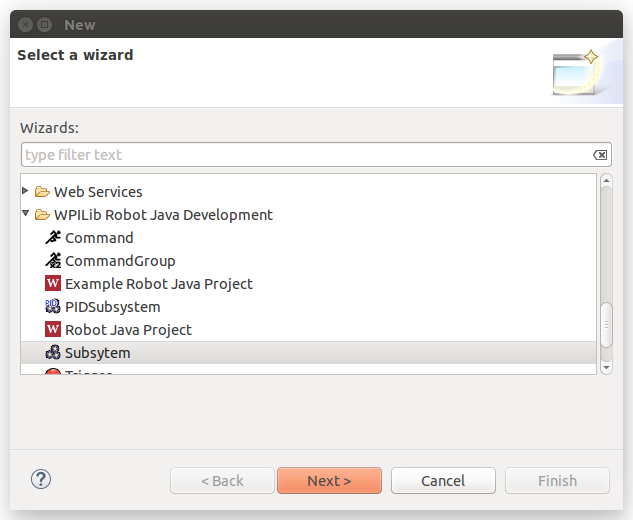 There are two ways to implement a PID loop with the FRC Java API: PIDCommand and PIDSubsystem. I recommend using PIDCommand, because PIDSubsystem means that you will always need to set a setpoint and let the robot go to that position. With PIDCommand, you can switch to manual control when you need it, and setpoint control when you need that. So, let's create a PIDCommand! First make a normal command and then change extends Command to extends PIDCommand. This will result in three errors. First, PIDCommand must be imported. Second, two methods need to be implemented in your command, the two being: returnPIDInput() and usePIDOutput(). 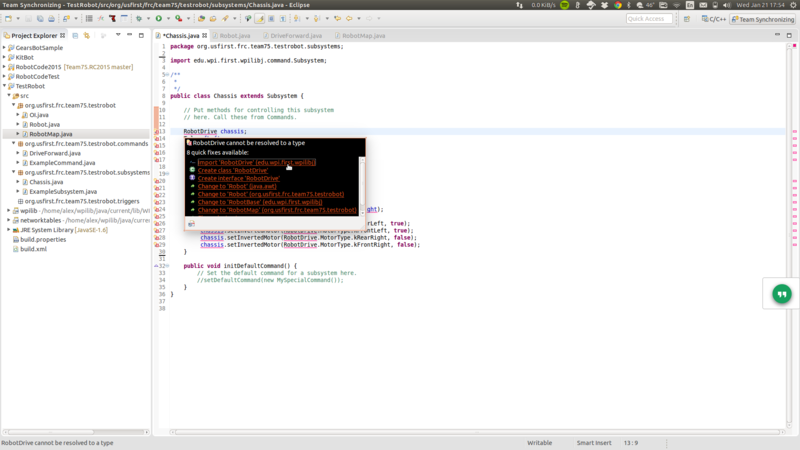 The first two are easy to fix, as Eclipse will notify you about them and give you the option to autofix them. 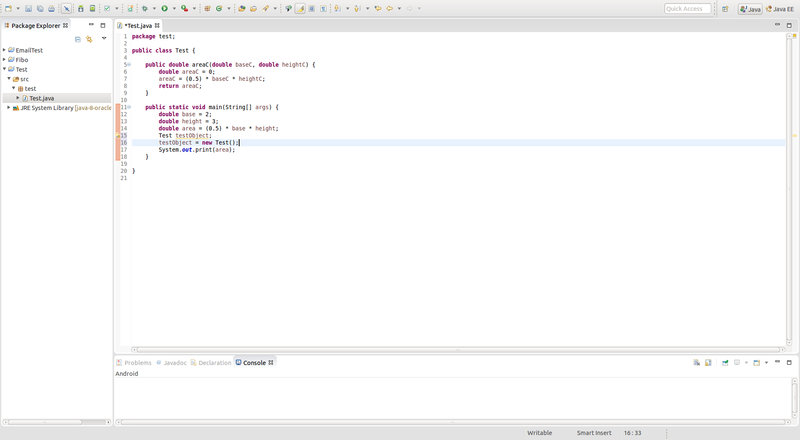 The final error will be that the superclass's constructor must be called. Basically, whenever you see the extends statement, that class is based off of the extended class, which is called the superclass. The class you are editing is called a subclass. This is why all Commands and Subsystems have the same default structure: they are based off of the same classes. When you extend PIDCommand, you have to contain the methods of the superclass (PIDCommand). 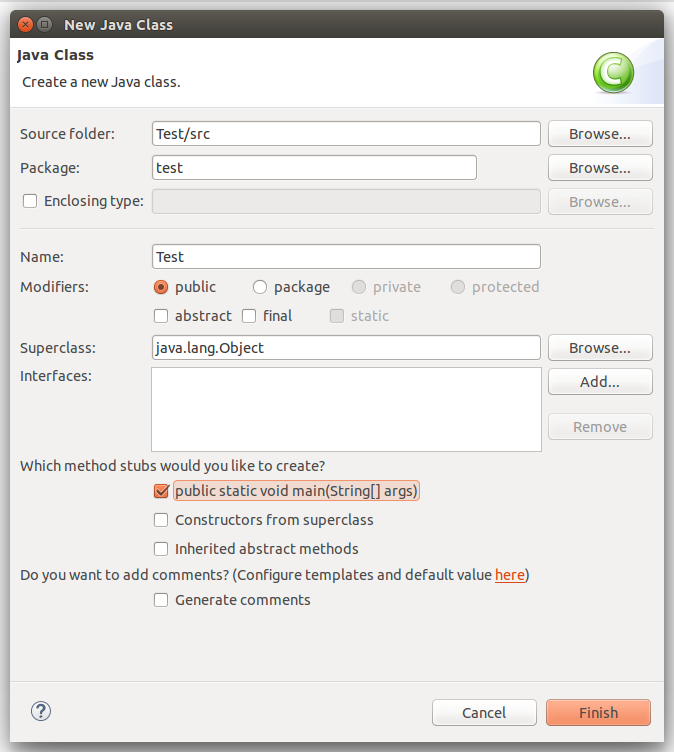 Superclasses also have their own methods that can be called through the subclass. This is why Command.cancel() cancels a command and why you can use the requires method, even though you don't code a cancel() or requires() method. Note: Distance units are inches and the output going down is only at half speed because the arm would go down too fast at -1 speed. That's it! Now you can go and make commands that use PID like a pro!